Litoměřice (Czech pronunciation: [ˈlɪtomɲɛr̝ɪtsɛ]; German: Leitmeritz) is a town at the junction of the rivers Elbe (Czech: Labe) and Ohře (German: Eger) in the northern part of the Czech Republic, approximately 64 km (40 mi) northwest of Prague. Cathedral of St. Stephen with belfry. The area within the Ústí nad Labem Region is sometimes called The Garden of Bohemia due to the mild weather conditions important for growing fruits and grapes. During the time of the Austro-Hungarian Empire, many pensioners chose it over more southern areas of the Empire. 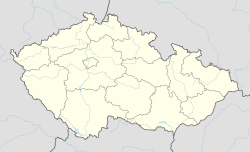 The town is also the seat of the Roman Catholic Diocese of Litoměřice (part of Archdiocese of Prague), the 4th oldest – and 3rd still existing – Catholic diocese on present Czech territory. The settlement of Litoměřice has a deep history of Paleolithic cultures as well as large Celtic settlements of the so-called La Tène culture, which did not survive the incoming Germanic attacks. The area was later settled by Germanic tribes, when Litoměřice first appear on Ptolemaios Map in the 2nd Century under the name of Nomisterium. The Germanic tribes later migrated west and those remaining mingled with the incoming Slavs. One of the oldest Czech towns, Litoměřice was established in the 10th century on the site of an early medieval Přemyslid Dynasty fort. The area was settled by the Czech tribe of Litoměřici, after which the town was named. In the High Middle Ages a small group of German settlers was also invited in by Slavic rulers. A royal-town statute was granted in 1219 by the Czech king. From the 12th to the 17th century it was a significant trading center in the Holy Roman Empire. The population suffered during the 15th century Hussite Wars. After the Protestant tensions with the Catholics that triggered the Thirty Years' War and the Protestants' defeat in the Battle of White Mountain, the surviving population of the city was forced to accept Catholicism or face property confiscation and the obligation to leave the kingdom. In this way, the town became a Catholic bishop's residency in 1655. As a result, the Czech Protestant population shrank and the town became largely Germanized. In 1918, Bohemia, Moravia and Czech Silesia became constituent parts of newly created Czechoslovakia (which was confirmed by the Treaty of St. Germain), along with large border area, inhabited predominantly by the Germans. Local Germans tried to join German Austria (which in turn aimed to join post-war German Reich), but Czechoslovak troops prevented this. Known under informal name Sudetenland, the region became the subject of political controversy in the following years. Slavs settled there again, but remained a minority. In 1938, after the Munich Agreement, German troops occupied the Sudetenland (and all remnants of Czech Lands few months later). Czech population, which had grown to about 5,000 people, had to leave again. In the final stages of World War II, German troops retreated to escape the advancing Red Army. Czech resistance took control of the castle on 27 April 1945, and after a few days they started negotiations with the German commander about the terms of his surrender. The Wehrmacht capitulated in the night after 8 May, but German troops fled on 9 May, just before Soviet troops entered the town on 10 May 1945. Most of the German population of the town was expelled by the so-called Beneš decrees in August 1945, along with about 2.5 million other former Czechoslovak citizens of German ethnicity. The Holocaust in Leitmeritz. "In Early April 1945: The SS evacuates thousands of Jews – mostly on foot – as Allied and Soviet forces press in from the east and west. Evacuees are taken to camps at Bergen-Belsen, Germany; Dachau, Germany; Ebensee, Austria; Leitmeritz, Czechoslovakia; and Theresienstadt, Czechoslovakia. The operation is rife with daily beatings and murders as well as deaths from starvation and typhus. Thirteen hundred Jews are evacuated on foot from Vienna; only 700 will reach their destination, the Gusen, Austria, camp, alive." There are several main sights already visible when approaching Litoměřice. The Baroque St. Stephen's Cathedral at the Cathedral Square (Dómské náměstí) was built in place of an older Romanasque basilica in the years 1664–1668. The interior is almost completely authentic with main and six side altars and a lot of original paintings. Right next to the dome is a bishop's residence built in 1683–1701 by Giulio Broggio. On the main square there is All-Saints Church and within distance there is an Annunciation (Lady Day) Church, another masterpiece built by the son of Giulio Broggio, Octavio. The old town hall (now city museum) and Black Eagle House (Dům u černého orla) on the main square are also worthy a look. The symbol of the city is a chalice, since the watchout tower on the Town Hall has this shape. There are numerous cellars connected by an extensive web of underground ways under the town. In some places, the cellars were built in three floors. The ways are about three kilometers (1.9 miles) long and they belong to the longest of their kind in the Czech Republic. Unfortunately, only 336 metres (1,102 feet) of these underground ways are open to the public. You can notice the ancient town wall when entering the town. The original town wall was built in the Gothic style. Northern Bohemian Gallery of Creative Arts (SGVU) is based close the main square. Extensive collection spans from 13th century to contemporary art with numerous other exhibitions during the year. Ferdinand Blumentritt, teacher, historian, ethnologist and close friend of the Philippine national hero José Rizal, lived and taught here 1877–1913. Josef Jungmann, creator of the modern Czech language, lived and taught here from 1799 to 1815. Alfred Kubin, Austrian expressionist and illustrator was born in Litoměřice in 1877. Karel Hynek Mácha, died in Litoměřice, shortly after he had moved to the town, and was buried there. Later his grave was moved to Prague where he is buried now at the Vyšehrad cemetery. Antonio Rosetti, famed classical composer was born in Litomerice. Cardinal Graf von Schönborn, current Archbishop of Vienna, was born near the town. Štěpán Cardinal Trochta was Bishop of Litoměřice from 1947. The Master of the Litoměřice Altarpiece received his name from this town. Martin Škoula, a professional ice hockey player currently playing for the Avangard Omsk of the Kontinental Hockey League. Milan Hnilička, former professional ice hockey goaltender, triple olympic medalist and septuple IIHF World Championship medalist was born in Litoměřice in 1973. ^ "The Holocaust Chronicle Prologue: Roots of the Holocaust, page 599". Holocaustchronicle.org. Retrieved 2013-03-26. ^ Michael Rademacher (dissertation): Deutsche Verwaltungsgeschichte von der Reichseinigung 1871 bis zur Wiedervereinigung 1990. Landkreis Leitmeritz, Osnabrück, 2006. Wikisource has the text of the Encyclopaedia Britannica (9th ed.) article Leitmeritz. Wikivoyage has a travel guide for Litoměřice. Wikimedia Commons has media related to Litoměřice.